From now on my #TechTime cohort - Matt 'Trumpets' Ragsdale will be providing his unique qualifying and race reports for the blog, I hope you enjoy them! Grey and overcast for the start of qualifying, the track barely rubbered in and everyone suffering unexpected losses in traction. FP3 ended with Bottas and Raikkonen both stuffing it into the barriers, with Valterri glancing off the Armco out of Spoon and Kimi straight into the tyre wall on exit of Degner 2, which cost the Ferrari driver 5 grid spots as he mangled his gearbox as it required replacing, along with lots of other expensive bits. Bottas' car, too, required extensive work to turn around including replacing the floor, but he had already collected his 5 spot penalty for a new gearbox which had been replaced earlier. At least Valterri could take comfort in having been fastest in the session, on the Soft tyre no less, followed by Hamilton also on the Softs, and Vettel on the SuperSofts. The red flags these incidents brought out spoiled more than a few fast laps, including that of Lewis Hamilton, who was out playing on his SuperSofts. 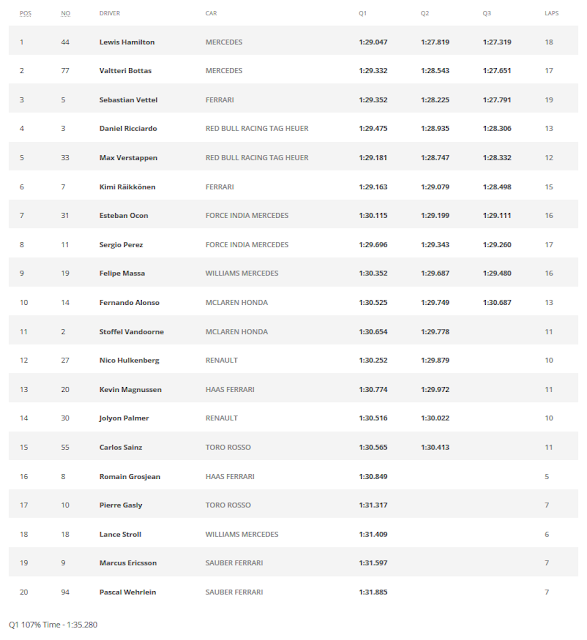 Also participating in penalty-palooza were Sainz and Palmer, dinged for 20 spots, and Alonso with a winning 35 grid spots for replacing every possible component he could thanks to a hydraulic fluid leak that destroyed his PU. Red Bull were fast in the corners but losing time on the straights (quel surprise) with Verstappen having ditched the T wing for FP3 and Ricciardo opting to keep it. Horner trotted out the usual niceties about race pace, but the fact remained that the "Malaysian Malaise" that afflicted the Mercedes flattered to deceive with regards to Red Bull's overall pace. Hamilton's first fast lap was a marker laid at 1:29.507 with 15 minutes left to go. 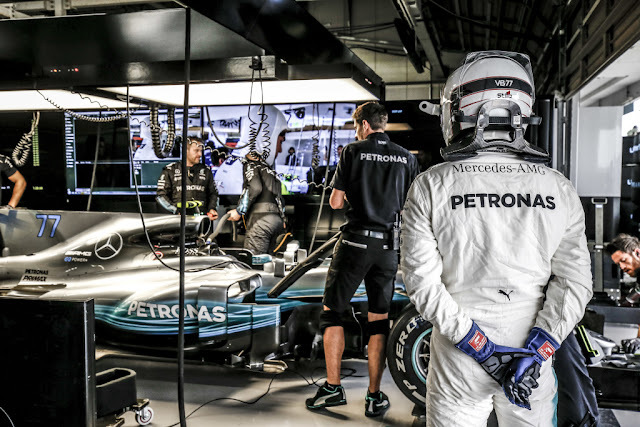 Vettel slotted in nicely behind, 0.265s behind and then, raising the blood pressure at Mercedes, Bottas on the Supers was off with a big sideways moment out of Degner 2. Into the gravel and somehow out without major damage and perhaps a certain loss of confidence. He was about 0.3s up in S1 up to that point. Once Valterri caught his breath he was able to set a time just 0.007s off Lewis, who had upped his game in the meantime, nailing down a 1:29.325 still on his first set of Softs. 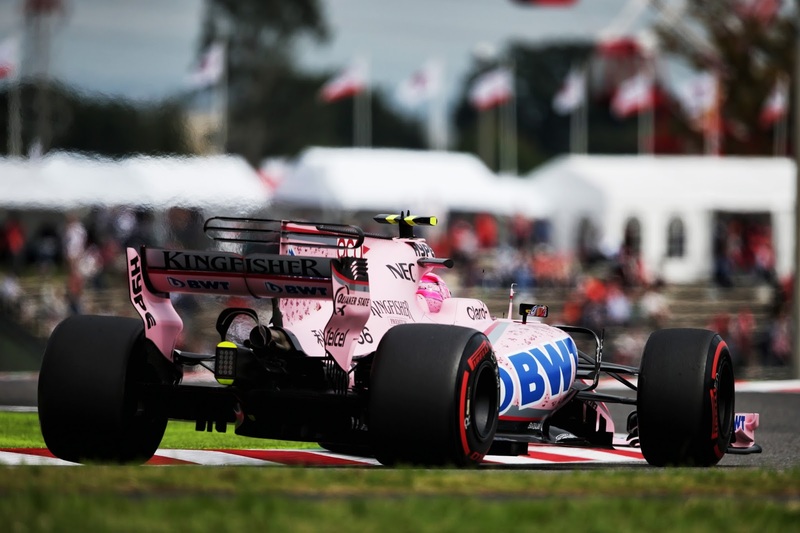 Perez had slotted behind Vettel as the Red Bulls had finally joined the game. And it was Verstappen, minus the T-wing, to the top with a 1:29.181, rocking that time on a set of Supers. P5 for Ricciardo with the T-Wing and P6 for Raikkonen set the sharp end of the grid as the clock ticked past the 6 minute mark. Magnussen led the way followed by Grosjean and Gasly. Sainz Vandoorne and Massa were the next trio up. But then the fun was rapidly spoiled as Grosjean lost it in the esses, into the barrier and bringing out the red flag. Big mess and end of Q1, with Grosjean saying it was something on the car and Gene Haas' face registering every single dollar sign that off had just cost him. 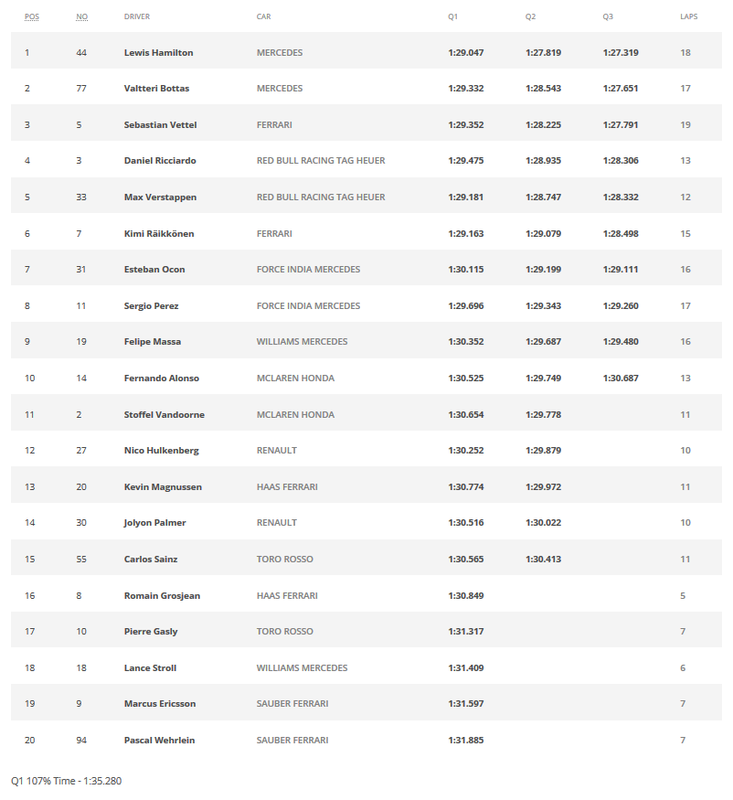 Hopelessly turfed were the laps of Gasly, Stroll, Ericsson and Wehrlein and they, along with Grosjean in P16, were off in search of shiokara and redemption. The rest reset in the quest for glory in Q2. Vettel on the Supers could do no better than 1:28.482, still good for P2 but far off the time of Hamilton. Bottas took P3 ahead of Verstappen, but nearly 0.7s adrift of his teammate in P1, not entirely surprising when you consider he was running the Soft tyre, mirroring Raikkonen's strategy as he sported a similar penalty. Ricciardo on the Supers, took P5 ahead of Raikkonen. 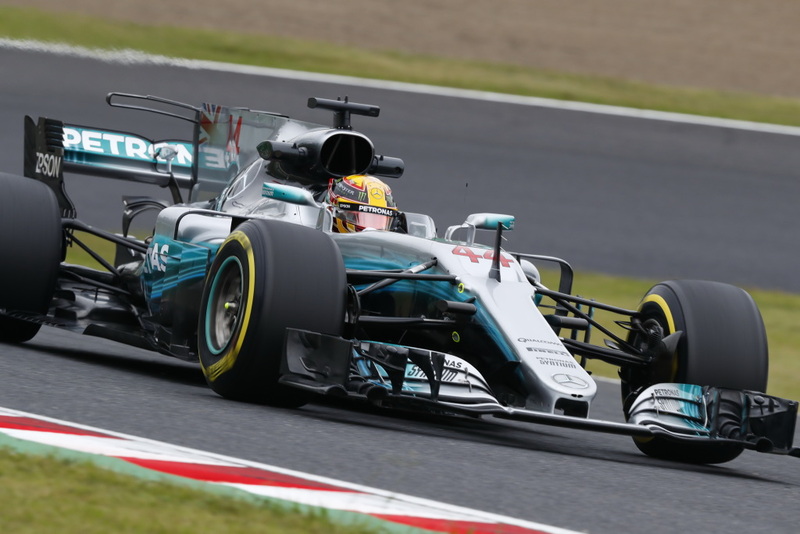 Can it be, first pole for Hamilton at Suzuka, so congratulations due there, never mind the ruthless crushing of the former track record, by well over a second. 5 spot for Bottas means P2 start for Vettel and he and Raikkonen will certainly motivate the early action as they move forward through the field. Red Bull looks set to be playing in their own sandbox, faster than everyone else but slower than the top 3. With luck, Horner's race pace refrain will have a bit of meat to it and Red Bull will be able to mix it with the leaders. Copyright F1.com - Penalties will adjust the formation of the grid (Raikkonen and Bottas 5 place grid penalties for gearbox changes, Palmer and Sainz 20 place penalties and Alonso a 35 place penalty). A new home? Well, couldn't ask for a better pairing than Mr. Somers. Hope this grows a lot more.